Early in December, my instagram account was hijacked, with someone claiming my site as their own. When I tried to go on, I was logged out, and a new email was on the account, a Jazmin Kajigore. I got no notice from Instagram that my email was changed, and now this imposter was posing as me, claiming all my artwork as their own. After much research I found that thousands of people are having their Instagram accounts hacked in this manner in the past year. The hackers seem to originate from Russia. There is speculation that Russia is gearing up for our next election, and will be using these accounts to post divisive opinions when the presidential race is going full steam. Instagram would not migrate my account back to me, even though I supplied all the proof they asked for. I never got ahold of a real person, only their answer bots, which just circled around the same tired “solutions.” In the end, I was able to regain my account name terri_murphy_illustrations as a new account….empty. No postings, followers or following. The Jazmin Kajigore account was deleted. Now I have to rebuild from scratch. After the Russian meddling scandal using Facebook (who owns Instagram) to disrupt our 2017 Presidential elections, it seems that keeping on top of things is a low priority for them. It causes people to distrust what they see and question with suspicion. Russia wins. I shudder to think how it’s going to be amped up in the coming years as the next presidential election process unfolds. Writing about myself is my least favorite thing to do. But it's a good exercise, and one I performed at the invitation of VoyageChicago, an online magazine featuring local Chicago artists and entrepreneurs. The process of gathering my thoughts made me realize how much of my childhood loves and passions I have carried into my adulthood. Is it a Peter Pan "I don't want to grow up"? I don't think so. More like, finding the missing pieces of a childhood puzzle that was never quite finished. Our very active Chicago area SCBWI Illustrators group participated in the #meettheartist initiative. Here's mine...at first I had more dislikes...but this one topped them all! Treacherous territory!! I had the recent honor of being the featured speaker at the Youth Services Forum Author Breakfast for the Illinois Library Association convention. The honor is reserved for the creator of their upcoming iREAD poster to promote summer reading, which in 2018, is me! See blog from July 5, 2017. I spoke of my influences, my youth, and the wonderful marriage of being a (part-time) youth services librarian as well as a children’s book illustrator. I also had the opportunity to create characters from the poster that will make their way on to promo merchandise and to librarians in Illinois, California, and in USA military base libraries in 24 countries for their print and online use. Thank you for everything, ILA and iREAD! Currently working on illustrations for feature story in Spider Magazine, Feb 2018 issue....work-in-progress below! I’m still spinning from the American Library Association debut of the ILA iREAD Summer Reading 2018 posters I created for the theme “Reading Takes You Everywhere.” I signed them and was thrilled to meet so many librarians and educators. Below is the children’s poster, which is what I imagine happened after the last page of my picture book “One Day I Went Rambling” authored by Kelly Bennett, where a bunch of inventive kids see a bare tree in the distance. The Illinois Library Association wanted the theme to be widely interpreted, and "everywhere" can mean in imagination, time travel, inner and outer space, dystopian scenarios, scientific discoveries, etc. Besides posters, ILA will put out a lot of swag with this image, on t-shirts, postcards, water bottles, pencil cases, etc., and offer it in a catalog to Illinois Libraries. Word is ILA will reissue “Rambling” in mini-paperbacks for libraries to use as promotional give-aways!! Here is the summer reading poster of the same theme for the military, which will go out to U.S. bases in 24 countries. Now I’m off to the SCBWI-LA conference, July 5-12 including the pre and post parties/training. I'll be wearing many hats, as an illustrator, as Illustrator Coordinator for Society of Children’s Book Writers and Illustrators/Illinois, and for the first time, as a writer! In addition to a portfolio display event on Saturday, I’m showing a picture book dummy….which has been a labor of love these past few months. Who’d guess I’d end up loving a spider? Wicked! I walked into a huge spider web the other day. Still gross. Or maybe a good sign? School Visits End, Creative Summer Begins! The end of the school year is a time for a little fun. 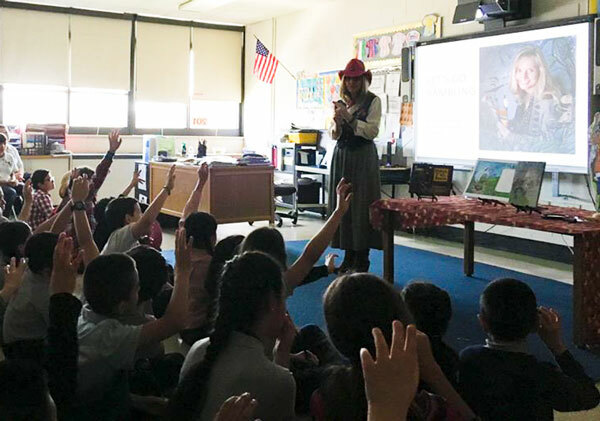 Last month, I was grateful to Drexel School in Cicero, IL, for including me in their Reading Rodeo. 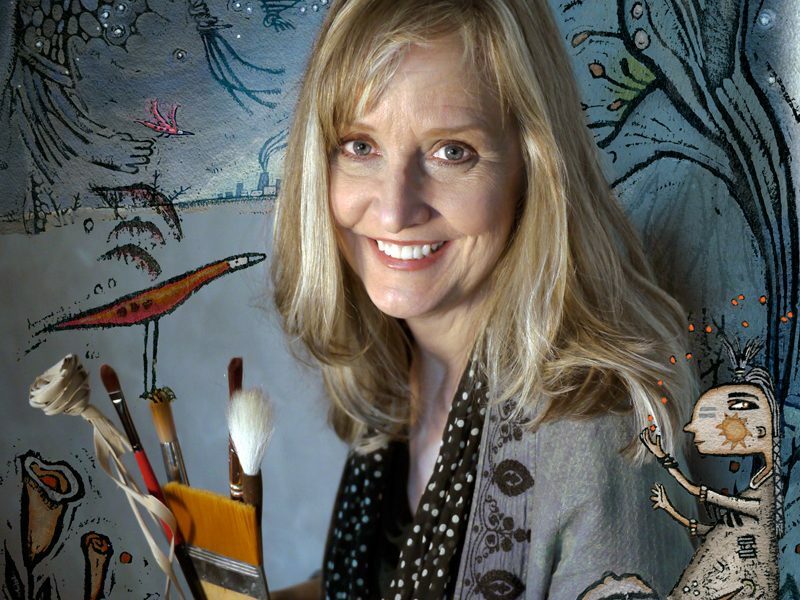 Often schools focus on inviting authors to speak, and it may pass their radar that illustrators tell stories visually. Creating a story for an illustrator is akin to making movies, using a limited number of still shots. I also will confess to having a secret weapon for school visits…the coolest mascot in the world. A light-up chameleon! Just like in the book I illustrated, “One Day I Went Rambling,” the chameleon changes to the color to the kid with the most creative thought. We play creativity games, and viola!, the chameleon shines its stamp of approval! The best keepsake for me is the surprise thank you cards in the mail…. Summer starts for me with a project of my own…creating a dummy book for one of my picture book manuscripts titled “Stella Can’t Wait” in time for the SCBWI LA conference in July. Are you ready for a creative summer? So am I !! The chameleon is lighting up all over the place! A mind tends to wander in the moment of color-mixing and brushstrokes. This thought came to me one day: everyone does the best they can. And much of that is influenced by the circumstances of one’s birth. Geography, economics, special challenges, the family culture are all part of the cards we are dealt. So, “what if” I thought, I illustrated children that were hyper-aware of their situations and challenges, and had the innocent inherent wisdom to use it to its best advantage? What if they were the agents of change not despite their hardships but because of them? Certain phrases have stuck with me all my life, such as “to see beyond the bend of midnight trees” or “do not forget why you came here.” More recently a dream about tornadoes informed my choice. Frantic people were running for safety, but children knew to lean into the wind, with spectacular results. So I conjured up illustrations to these phrases, posting one each Friday on social media. And the funny thing is, once you’re on that trajectory, your mind bends that way. Creativity happens in the moment of doing….one cannot intellectualize it beforehand. After 13 weeks, I had 5 good ones to submit to a juried competition for The Bologna Children's Book Fair in Italy. I am excited to send these children, these agents of change and goodwill who came to me and through me, out into the world representing the U.S.A.
For the 3rd consecutive year, with fingers crossed for acceptance into The Bologna's Children's Book Fair 2017, I ask, “Italy...will she call my name?" Time will tell…but that’s never been the goal anyway. I’ve done the best I can. I’ve already been richly rewarded. Now I’ve come up with “Finished by Friday” which allows me to concentrate on one illustration for a week. The reason I do these challenges is because it flips a switch in my head. Daily experiences are filtered through the challenge, so if I hear a phrase, or if something catches my eye or attention, I’ll see if I can interpret it visually. This summer, one of my backyard trees never sprang back to life. Sad, in that it is the hammock tree, the bird feeder tree and the deck-shading tree. At the prospect of cutting it down, I began to see a shape of a woman with outstretched arms, facing the yards, welcoming all of nature. Now we are considering calling a tree surgeon to cut off just some tree limbs, and letting me loose with a mini chain saw to sculpt the rest. Scary! But in the meanwhile, I illustrated it (June 3rd illustration shown at top). Above are the subsequent “Finished by Friday” illustrations (also shown on my Portfolio page). Friend me on Facebook or follow on Twitter to see what develops next! Sometimes, you gotta revisit the past...go back to the beginning. Figure out how early passions inform the present. For me, it's the memories of art school, my love of drawing/painting people from life, capturing their faces and the stories behind them. I was very happy to discover a professional gathering of artists happening just a stone's throw from my home, the Pauper's Art Guild. Like a kid in a candy shop, I was instantly enamored of this place filled with serious (and fun) artists. The walls display gorgeous original art while numbered prints on the consignment pile wait to be framed. Tom Waits, Elvis Costello or some obscure indy band urges us on as those present delve into it with the medium of their choice. While it was a bit of a rough start getting back in the swing of drawing from a model, soon everything resolved itself. The atmosphere goes from silent intensity to raucous debates with a little blue humor mixed in. I found my tribe, in my own 'hood, no less! One of the most captivating and productive school visits I ever had was when I recently met with 50 Young Authors at the Union Ridge School in Harwood Heights, IL. In the first half, I presented Visual Storytelling using my latest illustrated picture book "One Day I Went Rambling" as a guide. In the second half, students read the first 2 minutes of their story, and as a class I led the discussion in helpful critique...what we liked, suggestions for improvement. In between, the students had a visual challenge to exercise their imaginations. I showed my own "Illustration-A-Day" challenge where I created art from a "3 unrelated words" daily prompt. First, I showed the art I created from the words "lamb, night sky, microphone." After that, I just showed various other 3 words combinations and had them guess what an illustration might be. You could just see the gears turning, lightbulbs flashing, hands wildly waving. Eruptions of laughter and clapping ensued when their imaginations matched mine. Sometimes, their visual impressions were better. Sometimes they protested "Lizard was not one of the words." To which I answered, "I didn't say you COULDN'T put a lizard in!" Then we talked about using imagination in writing. We even made the online school newsletter. Kid writers + Illustrator....what a great equation! 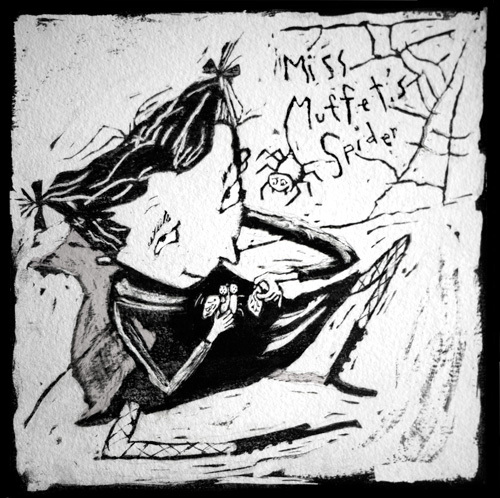 A naughty Miss Muffet feeds lunch to her hungry spider! I've never held a contest before. Maybe I'll get 5 participants. Or 50. Or 500! After hearing about "Inktober," a creatively-inspired group effort of artists posting daily inked drawings on social media for the entire month of October, I chose to do a half-marathon.I posted my inked creations on odd days only. Now I'm having a contest to give the original art away! Your choice of art!! Starting May 1st .. Let the wild rumpus begin! Feeling wonderfully inspired after the SCBWI New York conference. So I’m mailing out promo postcards. Pulling some stories off the back burner. Crafting new ones. Maybe it was general consensus among publishers that the picture book market is rebounding. Maybe it was witnessing the many editors, agents and art directors who were not part of the conference make a special trip in to view the Portfolio Showcase. Or maybe it was these lovely tiny foods in glasses. All I know it that I'm usually spinning around for a few days after a big conference, overwhelmed with information, trying to get my bearings. Thank you SCBWI, for being at the helm of one of the nicest industries there is, and for putting us all in touch. The best thing about doing school visits featuring my latest illustrated picture book, “One Day I Went Rambling” (Bright Sky Press, Kelly Bennett-author) is that inspired kid ramblers will rev up their imaginations weeks before I get there. Children will often pair up with others or entice their families to go hunting in junk drawers, nooks-and-crannies, and outdoor environments for cast-away and forgotten items. Using the two most creative words in the English language, “What if…?” they transform their found objects into a new creation of their own inspiration. I’ve had the pleasure of presenting the picture book illustrator’s craft at school visits and have more booked on the horizon--but Springfield Elementary in Midlothian, Illinois, knows how to do it right! I realized this as soon as I walked in and saw their Welcome Bulletin Showcase with a Rambling theme, to honor my latest illustrated picture book “One Day I Went Rambling” (author,Kelly Bennett, Bright Sky Press 2012). You can find out more about booking my picture book illustrator program here . The IRC (Illinois Reading Council) published an interview with me in their quarterly Journal, Spring 2013 Edition. In it, I speak of my childhood, the road that led me to children’s illustration, and my inspiration. Thanks to the IRC for featuring my work!